The Vassar women’s varsity volleyball team dug, aced and blocked their way to an undefeated weekend at the Vassar Invitational. Not only did the Brewers win each of their four matches, but they did so without dropping a single set. The team matched up against King’s College and Medaille College on Friday and against University of New England (UNE) and Bates College on Saturday. In their first contest of the weekend, the Brewers faced the King’s College Monarchs. The team played well on both attack and defense, but it was Vassar’s ability to execute powerful serves that secured the 3-0 win. The Brewers had 15 aces over the course of the match while allowing the Monarchs just one. Vassar also had double as many kills as King’s with 38 against 19. 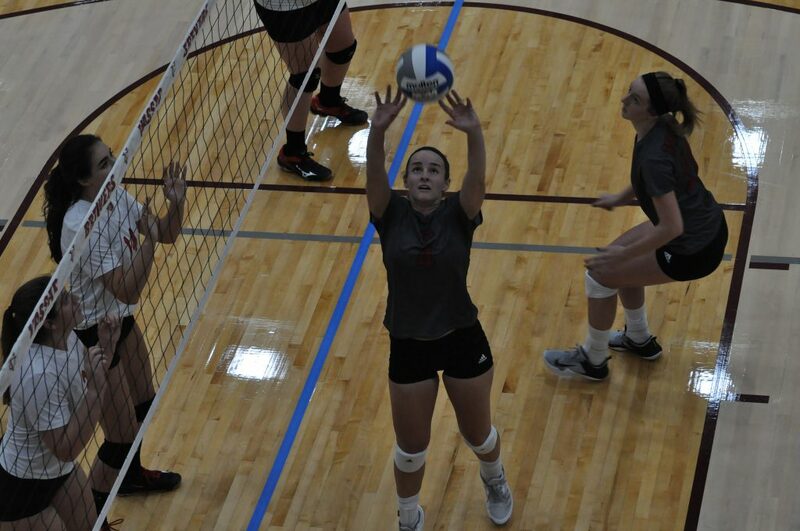 Sophomore Jane McLeod struck 10 kills, while junior Devan Gallagher and sophomore Colette Cambey had nine each. In the second match of the day, the Brewers took on the Medaille College Mavericks, securing a comfortable win with scores of 25-16, 25-17 and 25-20. Vassar’s defensive unit held the Mavericks to only 17 total kills, compared to the Brewers’ 39. Vassar proved to be a stronger hitting team posting a 0.172 hitting percentage while the Mavericks finished the match at 0.011. Again, Gallagher was among the leaders in kills, putting up 11 in the second match of the day, while Cambey and senior Bria Corham both posted seven kills. Junior Annie MacMillan was responsible for 30 of the Brewers’ 38 assists. In their third match, the Brewers were finally put to the test. The match against University of New England started off easy, with Vassar flying through the first two sets 25-9 and 25-7. However, the last set proved to be a challenge for the Brewers, who eventually pulled through with a nail-biting 32-30 win. McLeod dominated the match, putting up 16 kills and five aces, while Gallagher and Corham recorded nine and seven kills, respectively. MacMillan led the team in aces with nine. The Brewers improved their hitting percentage to 0.304, rivalled by UNE’s 0.139 hitting percentage. In their final match, the Brewers had no trouble bringing home the fourth win of the weekend and securing the Invitational title. Facing off against the Bates College Bobcats, the Brewers sailed to a 25-11, 25-18, 25-22 win. At 0.369, the Brewers posted their highest hitting percentage of the tournament. The Brewers struck an impressive 51 kills, 18 coming from Gallagher and 12 from Cambey. MacMillan is satisfied with the way the team was able to play as a unit and develop throughout the Invitational. “The team had a solid weekend,” MacMillan said. “We had opportunities to work on a lot of things offensively and defensively, as well as mix up various line-ups.” MacMillan added that everyone on the Brewers roster got the opportunity to play this weekend, which is rare in college sports. MacMillan, a junior, has come back strong for her third season as a Brewer. Through the first nine matches of the season, MacMillan has already posted an incredible team high of 323 assists, as well as 52 digs and a team-best 23 aces. Looking ahead, MacMillan is hoping the team can use their upcoming matches to get ready for Liberty League play. “We are in a strong conference and will use every opportunity to prepare during these next two weeks,” said MacMillan, who is eager to get into conference play. She feels the team has potential and versatility, two essential characteristics. The Brewers are extremely dedicated this season, using the fact that they failed to take home the Liberty League championship title last season as motivation. After a 4-0 weekend without dropping a set, it is apparent that all the work the team is putting in is paying off and priming them for a NCAA run. As a senior, Tiajoloff is determined to be a leader on this year’s team. This sense of urgency has given Tiajoloff high hopes for the team this season and a win-now mentality. “As it is my last year on the team, I want to make sure we accomplish all that we can this year,” Tiajoloff said. “This determined group of women has a lot of talent and potential. It is very important to me that we live up to that potential.” With an undefeated weekend and with three other wins under their belt, the Brewers are already off to a stellar start. It looks like the team, stacked with a group of solid returners and a crop of talented first-years, is bound to live up to the potential that Tiajoloff knows the team can reach. Up next, the Brewers will travel to Montclair, NJ, to face off against Lehman College and Montclair State University on Saturday, Sept. 16.